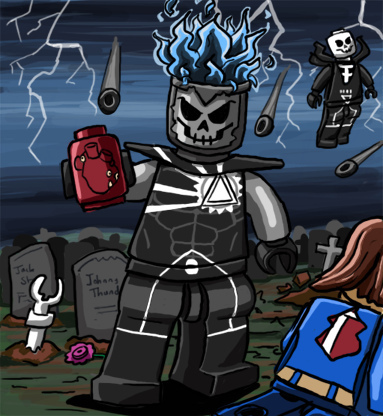 Check out this super-fun Black Lantern Firestorm/Deathstorm LEGO drawing by Catanas! Notice the heart he’s holding is a LEGO piece! Sick, twisted, and adorable! Over at Eurobricks, a LEGO-related site, they are hosting “Superheroes Month!” A talented artist known as Catanas has submitted several cartoons of DC characters in LEGO Minifigure form. In regard to this drawing, the artist said, “I found this one quite tricky actually. A pain to pose and then get the costume right while maintaining a Lego-ish feel!” In addition to Black Lantern Firestorm/Deathstorm, they’ve drawn Supergirl, Star Sapphire, Clark Kent, Hawk & Dove, Hush, Lobo, and more will be posted throughout the month! Each is adorable and really well done! My thanks to Clark Edwards for sending this my way! Support Firestorm (and LEGO Deathstorm)! Fan the bricks … err, flame! Posted in: Deathstorm/Black Lantern Firestorm, Sketch/Art.